And help bring healthcare to Topeka’s underserved. The growing tradition of Hotcakes for Hopecare is coming to Topeka. 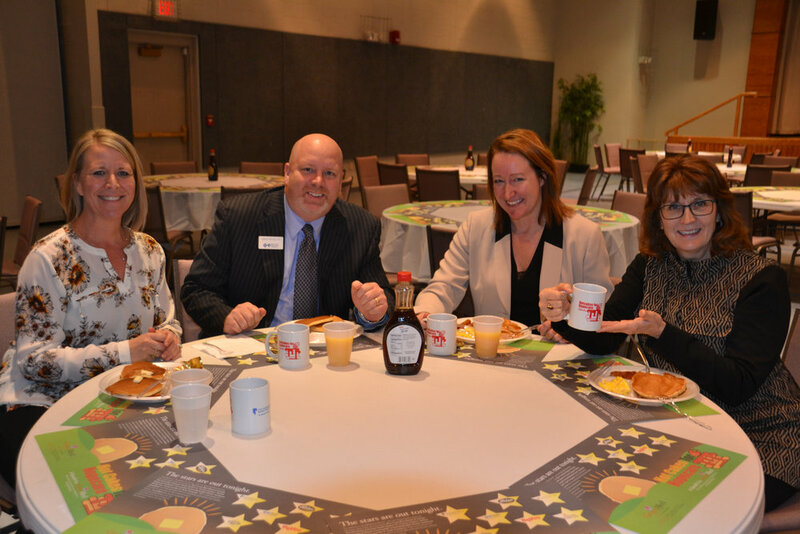 Meet us for a benefit “breakfast for dinner” event at Countryside United Methodist Church. Bring the family and come hungry to this supper time serving of hotcakes, eggs, and sausage served up by local celebrity servers. Stop by anytime between 5pm and 7:30pm. There's no tastier way to make a difference for a healthier community. Tickets are just $12 in advance and $15 at the door the evening of the event. Our thanks to Countryside United Methodist Church for hosting the event. For questions about this event, please contact Director of Community Development Alice Weingartner by email at aweingartner@gracemed.org or by phone at (785) 478-5901. GraceMed's Paula Bacon signs in the volunteers. Becky Honaker and Kristin Stock stopped by from Valeo to show their support. Jennifer Falk, Darin Fieger, Christie Mugler and Gwen Nelson stopped by after a busy day at Blue Cross Blue Shield. Linda Ochs from the Shawnee County Health Department, GraceMed’s Alice Weingartner and Misty Kruger from Topeka Public Schools take a break from their food serving duties. Mike Turner with WIBW-TV steals a bite of “breakfast for dinner” from Jannett Wiens of Washburn University.